Good morning everybody. I just heard part of Kevin Kelly's talk in the other room, and he made a couple of very interesting statements. I identify Kevin as Mr. Technology because of his editorship at Wired Magazine, and one of the things he said was "I hate computers, they're so stupid." Then he put up a slide that said, "Technology wants to be like life." Note well his distinction between "stupid" technology and the natural living systems we aspire to make it more like, presumably because they are not stupid, but intelligent. Towards the end of his talk he said, "Any individual species is a bigger idea than most human ideas," another hint of nature's superiority over our understanding and ability to emulate it thus far. He was talking about the Information Age as an age of ideas -- ideas exchanged in conversation. To me, life is nothing but a big conversation. It always has been. It always will be. One of my very favorite books at present is The Clue Train Manifesto. It's a wonderful book about the Internet as a conversation, describing the Internet's ability for lifting the clamp on conversation that humans have imposed on themselves over the past few hundred years by creating our human organizations as mechanical models. Most of the jobs of management in these top-down, command-and-control corporations are about keeping people in boxes so they won't talk to the wrong people; about suppressing innovations because they're not part of the plan. And now the Internet comes along and is changing all that because, as The Clue Train Manifesto points out, the people inside the corporations are talking to their markets, and markets are thus reverting to the conversations they were historically before the industrial age. If you want to know whether a product is good, you're not going to listen to the company's hype. You're going to go and get into a chat room or onto a listserv and find out who has the product and what they say about it, or talk to an employee of the maker who knows the real scoop. So the way we do business is changing a lot. What I want to show in this talk is that because the Internet is a self-organizing, somewhat chaotic (and it must be chaotic to be self-organizing) system, it has the power of life, while most corporations are modeled on old mechanical systems which are not alive. Remember that Kevin Kelly just called even computers, our newest mechanical systems, "stupid." I will argue that the Internet, on the other hand, is alive and thus has the attractive power of life to pull in the corporations and change the way we're doing business, not to mention the way we're doing education, the way we're doing health care, everything. Once we have this big human conversation, we will experience real democracy -- which we haven't had yet. Remember Gandhi, who, when asked what he thought of western democracy, said, "What a good idea; they should try it." We are now trying it out. We are trying it through the Internet. The problem I encounter most in trying to talk about living systems to people is our society's failure to understand living systems. Why is it that our culture, which is made up of people who are alive (so presumably we are a living system), knows so little about living systems? The answer has to do with the coincidence of the rise of science and the rise of the Industrial Revolution, such that our scientific models were all taken from the heady new mechanics. Remember what Kevin Kelly is saying: our technology is trying to be like life. Technology has always been the biomimicry Janine Benyus is bringing to our attention -- that is, our technology has always been inspired by nature -- but we assumed that nature, as Descartes had insisted, was merely complex mechanics invented by a "Grand Engineer" God. It's true that we evolve our technology as we understand more, but our understanding of life has been limited by the pretense that nature is complex machinery. We have failed to investigate living systems in their own right, without the assumption that they are mechanical, until very recently. For example, we used to think the brain functioned like an input-output plumbing system -- a system of pipes and valves in which things got jammed up and had to be released and flushed: the Freudian model of the brain. Then we invented the telephone and suddenly the brain was a telephone system. The neurons were wires relaying the messages down the wires, and things like that. Then we invented the computer and, lo and behold, the brain became a computer. Then it became a holographic camera and projector. Then we invented parallel processing. So the brain became a parallel processor. In other words, as technology comes closer to emulating our observation of life, we continue to project the latest technology onto life itself, ever confusing our models with natural reality. I call myself a post-Darwinian evolution biologist. The theory that Darwin gave us was wonderfully pioneering over a century ago. But how many scientists are still working with theories from over a century ago? Science itself is an evolving process. Darwin worked within a scientific worldview of a non-living universe without intelligence or purpose, evolving by accidental mechanical events. This worldview was the only alternative when science threw God out of its picture and decided that everything must have happened by accident. The official story of Earth was that particles of dumb mud bootstrapped themselves into intelligent, living systems. Frankly, I think that story is going to look a little bit foolish as physics continues with its understanding zero point energy, non-locality, the fundamental role of consciousness and the replacement of particles with information as the fundamental units of matter. I sure hope these concepts will creep into biology, because most macro- and micro-biologists are still working at the Newtonian level of mechanics. They see molecules with certain shapes bumping into each other, with this and that happening by accident, and evolution mechanically replacing those organisms that don't work well with others that do -- that fit into the system like cogs into wheels, which was interpreted as being the fittest in human terms of strongest, most powerful, and best able to wipe out competitors. Interestingly, the Soviet Union revered Lamarck, the champion of heritable acquired characteristics, while the West revered Darwin for implied Social Darwinist applications. Now biologists are finding out that Lamarck was perhaps closer to evolutionary reality than was Darwin. We have fifty years of laboratory evidence (for example) that DNA reorganizes itself intelligently in response to events outside the organism. That work was pioneered over half a century ago by Nobel laureate biologist Barbara McClintock, demonstrating "responses of the genome to challenge" in corn, a highly evolved species. A lot of later work, such as that of Eshel Ben Jacob, has been done with bacteria because they're easier to study over many generations. Ben Jacob concludes that bacteria not only alter their individual genomes intelligently but display group mind in doing so. As an illustration of the failure to understand life, take the human genome project. I like to say that when they map the human genome they're going to know as much about a human body as you would know about New York City looking at its telephone directory; or as much you would know about a beautiful Peruvian hand-knit sweater if you unraveled it and measured the kinks in the yarn. Would you be able to reconstruct it from those kinks? -- from that string of kinks, from that series? DNA is usually pictured for us in books as this neat, static double helix, along which we can map its chemical components in a linear chain. First of all, consider the sheer amount of it in you own body. If you could take the DNA in each of your cells, and stretch these bits out end to end -- about six inches per cell -- guess how long it would take a jet plane flying a thousand kilometers an hour (I'll do it in kilometers because that makes the zeros easy to work with), to get to the end of your own DNA? Anybody want to hazard a guess? Twenty -- what? Twenty hours? Would you believe several centuries, flying day and night? We are talking about a serious amount of DNA in every one of us. Do it with the zeros, you have 30 to 50 trillion cells in your body. Now consider how all that DNA in each cell is packed up into a tiny little, invisibly small nucleus, in which it is writhing around like a mass of snakes. And it is not only in there by itself; it's wrapped around bits of protein that help it organize and of course there's water in there and all of this highly active and reactive. It is subjected to things coming in and out of your cells and their nuclei all the time -- viruses, bacteria, loose snippets and rings of DNA called prions, transposons, etc. from who knows where or whom. All this DNA dialogue is happening continually -- endless conversation going on right inside the nucleus of every one of your cells, not to mention the cells of all other living creatures, including the soil bacteria, which are so closely packed that a handful of soil contains more DNA than your body! Stop a minute to think of that. A vast natural conversation blown on the wind and waters, permeating all living things -- an Internet invented billions of years ago and still going strong as I will talk about a little later. Whenever appropriate, some little piece of DNA brings itself to the cell's nuclear surface and unfurls itself-- exactly the piece that needs to be unfurled -- and copies itself. The copy shoots off to another part of the cell where the plan is copied again to, say, build some particular needed protein from it. By the way, the only part of the DNA that scientists know anything about is the protein-coding part, and that's about three to five percent. The other ninety-five to ninety-seven percent, they don't talk about, or if they do, they often call it garbage, or junk DNA. Now, as far as I know, junk is a human invention. If you look very carefully at nature, you will not find any junk. So it likely has a lot to do with the organization and maintenance of this highly intelligent system of cells in a body. And we don't know anything about it yet. Microbiologists discovered the capacities of bacteria to go in and out of cells and nuclei, and move things around, and switch genes. They even talk about editor genes and repair genes, yet official dogma still has it that none of this is supposed to be intelligent. How does DNA make its Appropriate choices? Why can a bacterial colony change its DNA depending on what's outside the colony or what's to eat out in their grazing fields? And how can they all change at once, say to change their DNA to create new equipment for digesting what's available to them when humans pull the rug out from under them and give them something they can't eat. They do it intelligently. Genetic engineering is only possible because we enslave bacteria to do the work for us. How do you think genetic engineering works? Scientists enslave bacteria and viruses to carry DNA into targeted cells, because they can't do it by themselves, any more than we can make beer or yogurt without the help of microbes. Did you know that bacteria invented polyester long before people? Theirs is sensibly biodegradable -- that's the only difference. The English, by the way, harnessed bacteria and put them in big vats to make this polyester for them. It's only in physics that we're beginning to talk about the deep reality of non-locality, which means that every point in the universe has access to the information at any other point. There will probably also be acknowledged, if not already, such a thing as non-temporality, in which anything at any given time in the universe (linear time) has access to the information at any other time. Because the basis of the universe is turning out to be a non-time-space "something" that is really "everything" -- precisely what the ancient Greeks called the Plenum. It isn't limited by time-space constraints. It doesn't have to worry about linear time. And as the deep reality of our universe, it is of course the deep reality of every one of our cells! It's the deep reality of each one of our molecules. It's the deep reality of each of us. But where are we technologically, scientifically? At breakfast this morning I talked to a man from IBM who said that they had estimated it would take about thirty years to figure out how proteins fold themselves into three dimensions -- into the "sweaterness" I used earlier as a metaphor for understanding DNA. They're trying to advance that project to the level where they might get the information in a couple of months. We're still at the stage where we can't even understand how individual molecules work, much less entire bacteria, or their complex city-state colonies, which we've only been able to look at without destroying them in the past decade. And yet we pretend to understand life. 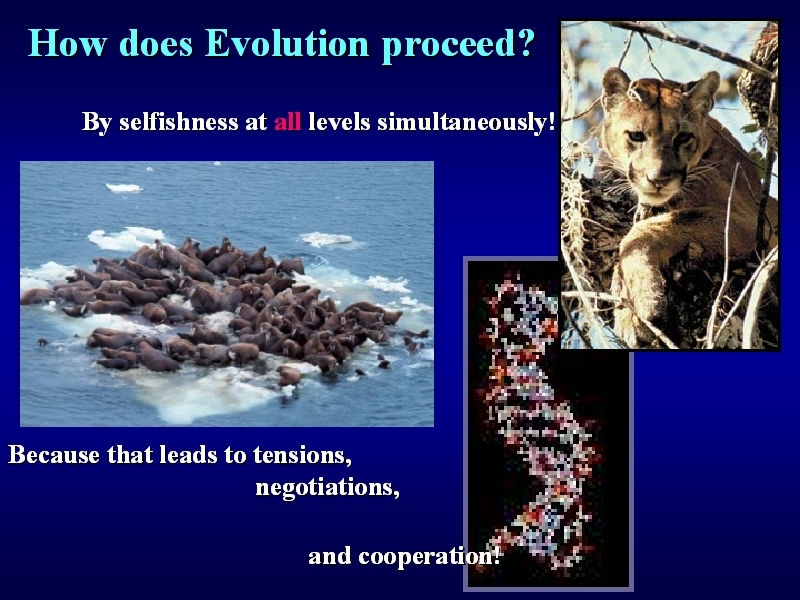 Let me give you my nutshell, post-Darwinian view of biological evolution in a series of slides. This is about trying to think holistically; trying to understand the big patterns in evolution and to see their relevance to us as human beings in our current stage of rapid evolution. Because if we as human beings don't understand ourselves as living systems within larger living systems, on which we're dependent, we aren't going to make it in this game. For that reason, it's an absolutely critical kind of understanding. We need to think more loosely and largely than our current paradigms. We need to think about the possibility that many other human cultures were right in perceiving a cosmic consciousness that creates itself as it goes and that is intelligent at every step of the way. We need to go way beyond asking "Is a bacterium intelligent at that lowly stage of evolution?" and ask "Are all bacteria and their planet Earth and our physical Universe and the entire Cosmos of material and non-material realms intelligent as a whole, as a whole intelligent unity or Oneness?" I believe that this is what we are finding out: that consciousness is the source of evolution, rather than a late product of an evolution in which dumb mud bootstrapped itself into intelligence. I do note that Kevin Kelly was talking about how intelligence arises from a lot of dumb units assembling somehow. That fits with the idea that mechanics are not the appropriate model for organics, and that life is more intelligent than our perceptions of it! I think he misunderstands life in saying there are a lot of dumb web pages on the Internet, but when you put them all together the Internet becomes intelligent. Web pages need not all be the products of creative genius to be intelligent, nor should they be seen as entities separate from their creators, and few of us would like being compared with the "dumb mud" image of reductionist scientists. It is of course true that multi-celled creatures achieve a new level of intelligence through the cooperation of their individual cells. And we humans now -- dominated by our western scientific culture -- are fumbling our way into this great conversation with each other -- the conversation squelched by convincing ourselves we were separate from and superior to the rest of nature, and by imposing our primitive mechanical models on ourselves in our organizations. No brain was ever assembled from individual neurons, as artificial intelligence (AI) folks seem to think they were. There was a long process of evolution -- over three-fourths of the evolution of Earth creatures -- before the first neuron evolved in the context of a multi-celled creature. My favorite part of evolution is the early bacterial world because already two billion years ago, they had built urban complexes with divisions of labor and warfare and technologies including the harnessing of solar energy, the invention of electric motors, the development of nuclear piles and the creation of their own Internet, which continues to this day as I mentioned earlier. In another parallel to out large creaturehood world, they had also created global crises of starvation and pollution, and solved them by shifting from competition to cooperation, as every life form must eventually do if it is to survive. We'll see All this in the slides, but I need to give a bit more background first. Not many people know that the Hopi suffer from radiation sickness in the same proportions as Japanese people through the generations because they were forced to mine uranium and told to take the tailings water from the mines home for their children to drink. The Japanese make documentaries on that Hopi situation. We don't talk about it. What is it that so makes us disrespect each other and all of life? We can't even listen to those elders who understand it. How many of you have seen the TV documentary about the Kogi Indians of Colombia made by Alan Ereira of the BBC, called Message From the Heart of the World: The Elder Brother Speaks? That video traveled like wildfire through native communities around the world -- I first saw it on TV in Greece on my small remote island. A wonderful scene in that film shows a tiny Kogi elder sitting in a hammock saying, "How, how do we explain to younger brother that he is destroying the mother?" They know he is and he is us! They sat on their mountain top and watched the mining and deforestation. They saw how it affected the weather patterns in their high altitude location, and they understood that they had to keep moving in order to farm. They saw the destruction; they understood it because they think holistically. A Mexican elder indigenous woman said to me once, "Anyone who knows how to run a household knows how to run a world." They leap levels and we don't. It's very hard for me to convince audiences that what goes on in your body is the same thing that goes on in the world economy as a larger living system. Because we don't understand the relationship of systems at different levels -- what I am about to describe to you as holarchy. With that, let's go to the first slide . . . In the beginning. . . Because our "in the beginning" story isn't settled yet, in my opinion, I look at the creation stories of other cultures and I decided I like one from India best as a metaphor for unity into complexity. The beginning is a smooth, unruffled, homogenous sea of milk. It's a wonderful metaphor for the Big Mama. Here is this undifferentiated sea of milk, and in it a tiny ripple forms. This little wave is forever after torn between loving its unique identity and wanting to merge back into the Big Mamato with which it remains connected, whether it acknowledges that or not. However, it does not remain alone. Soon there are lots more ripples and waves. Here you see them all looking at each other and seeing each other, and knowing themselves as part of the Big Sea. Much later, in some human cultures, they will forget this connectedness. But what we focus on here is this tension between the part and the whole, the individual and the collective, which is to me, the central tension driving creativity in the universe and on our planet. "Am I me? or do I merge into the whole?" Eastern cultures tended to stay connected with the whole, using deep meditation practices to maintain that awareness, while Western culture focused on "I am me!" We love being the individual and have forgotten the Sea; we have really practiced individuality and have now taken it almost as far as it can go. Fortunately, with the fall of the Soviet Union, we can say the word "community" again, and we're getting it now that without community we're not going to make it. All living systems are arranged as holarchies. That's Arthur Koestler's elegant word for the embeddedness of natural entities, which he calls holons. Holarchy is nestedness, distinguishing it from pyramidal hierarchy, which implies superiority at the top and is the metaphor for command-and-control systems. You, as a body, are this kind of holarchy -- cells within organs within organ systems within bodies. Elisabet says they're all right, but only together! When you have selfishness at every level of holarchy, what happens? If each person is looking out for their own interest within, say, a family, how does family integrity happen? There have to be negotiations that recognize family integrity as having its own self-interest at its own level of holarchy. Couplehood is a simple, two-level holarchy where the individuals are not only negotiating with each other, but with their couplehood, that second level of the holarchy. The integrity of couplehood demands certain sacrifices, doesn't it? It demands certain times when you have to back down and not get your way in order for couplehood to flourish. Budget, lifestyle, location and other "pooled" interests are those of couplehood. Seeing this may make negotiations less personally antagonistic. These negotiations must continue as long as couplehood survives. And it goes on as long as life goes on because we are always in some holarchy and this tension, as I said earlier, is the fundamental source of all creativity. So how do we run a world? Can we run a world without considering the other levels? The World Trade Organization tried doing that. But what happened? The self-interest of people came up and they went to Seattle in droves. They recognized the common interests of, say, environment and labor, so we had turtles and teamsters together in Seattle, despite our usual separation of ecology and economy. 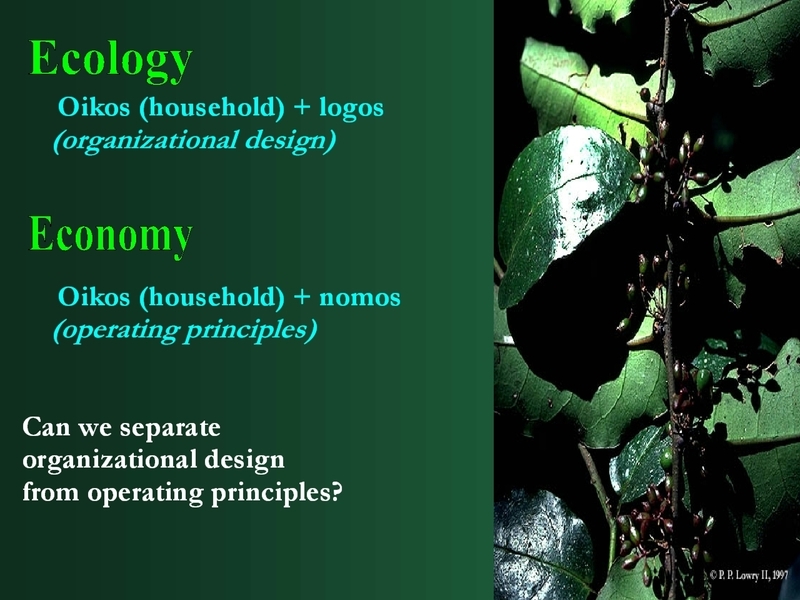 Looking at the Greek derivations of both these words from the word for household -- as its organizational design and operating principles -- we see why it makes no sense to separate them. Now recall the words I quoted at the beginning of this talk, by my friend, the indigenous Meshika elder Xilonem Garcia: "Anyone who knows how to run a household knows how to run a world." Perhaps it makes more sense now. The third world nations represented inside the WTO deliberations in Seattle, who were not being heard because they were overwhelmed by the more powerful nations, were grateful for the demonstrations, which helped them make their case inside. The self-interest of ordinary people, of local economies and of nations that aren't represented in the WTO is coming out more strongly all the time. It's a process of glocalization! That's exactly how living systems work, with all levels expressing their needs. It's not about making a choice between having either healthy local economies or having a healthy world economy. That's not possible. That would be like your body trying to run itself at the expense of its organs! Your body has full employment. Every cell is working and every cell has to look out for its own self-interest. Every cell is an extremely complex entity -- a society more complex than a human society. So it has to look out for its self-interest but not at the expense of its organs or its body. There's constant negotiation everywhere in your body at once to keep the whole thing running. Imagine trying to run your body like the world economy. You'd have these Northern Industrial organs (the heart-lung system) with the power to exploit the bone marrow for their resources. The raw material blood cells would be swept up there, the blood purified, oxygen added (that actually happens), to make a useful product. Then we have an announcement from the heart distribution Center for this finished blood product, The price for it today is so much. Who wants? You send it down to those organs that can afford it and the rest of it you have to chuck out as surplus or bottle it until someone can pay for it. How long would you last in that system? How long will our world economy last under that system? Remember the importance of self-interest at all levels to drive negotiations and cooperation in any viable living system. I love biology because it is so politically unassailable. It doesn't matter what your persuasions are, you all have one of these bodies. If your liver were trying to turn your heart and the other organs into other livers, it wouldn't work very well either would it? Diversity is the name of the game here. And what is the brain? Is it an autocratic government, like the WTO that demanded nations give up their sovereignty to join it? -- making up rules for the whole body? No. It's the ideal information collecting system that knows what's going on everywhere, and if it has to send aid to the big toe because you just cut it, is there a protest in the body about that? No, because there's an inherent wisdom in the body. Brian Swimme just talked about wisdom here. The body has the wisdom to know what it needs and to know that the welfare of every part, just as in a family, is at stake. The big cycle I see over and over throughout evolution is this: Some unity individuates, as you saw with the sea breaking up into waves, or as we know the homogenous early Earth individuated into core and crust, the crust then individuating into a myriad bacteria, and so forth. This individuation always leads to the tension and conflict we have already discussed several times, in couples and in the world economy as everywhere in nature. What comes out of that -- if the parties don't split up or kill each other? Negotiations, which come to the kind of resolutions that end in cooperation, with a new unity eventually forming itself at a higher level. Here's another example of that evolutionary cycle repeating itself over and over again in what I call Fractal Biology -- the same patterns of this cycle repeating themselves at ever larger levels of being from single cells, to multi-celled creatures to our present process of Globalization. 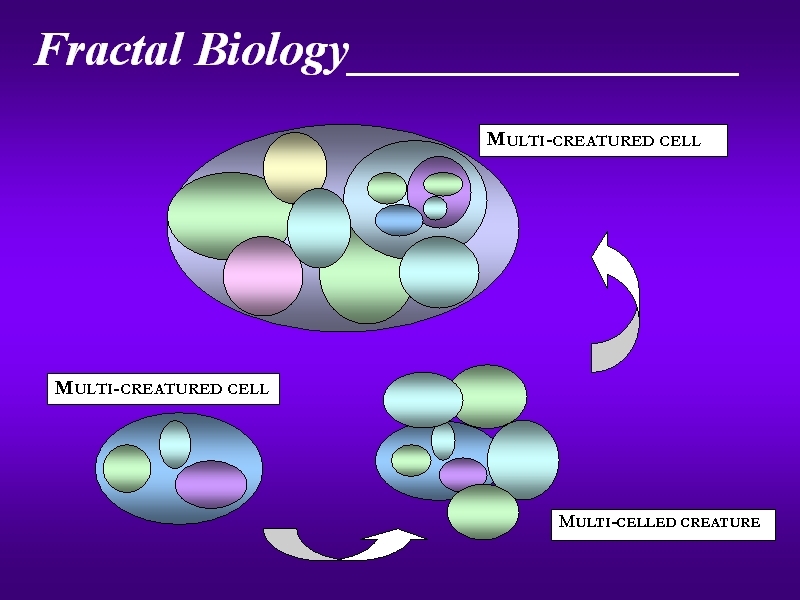 The individual circles in the first lower left entity represent the ancient bacteria that eventually cooperated to create the first multi-creatured cell. This was a huge leap in evolution because it was the only kind of cell other than the bacterial cell ever to evolve on our planet. We call it the nucleated cell. 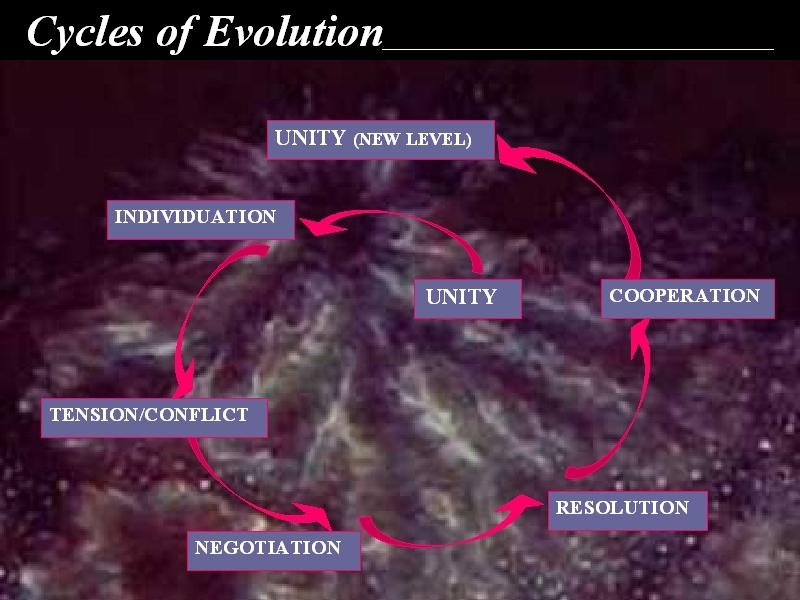 Before they could achieve this level of cooperation, the bacteria had to go all the way around the cycle from individuation. First, they invented a number of lifestyles, beginning with fermentation. The fermenters, which I call the "bubblers," populated the Earth by consuming the free molecular food, such as sugars and acids, found in abundance on the early Earth. Eventually this free food supply ran out, causing the first global hunger crisis. This stress gave rise to the second type of archeobacteria, which invented solar technology, making their own food by photosynthesis. I call the photosynthesizers "bluegreens." They were hugely successful, covering the Earth, but eventually their deadly waste gas, oxygen, created the next global crisis, solved only by the invention of the third lifestyle, which turned this nasty poison to good use in the technology of respiration. So, after the bubblers and bluegreens, we have the "breathers," which smashed food molecules with oxygen to liberate their energy. What food molecules? Breathers streamlined themselves and invented electric motors -- tiny disks with tails attached, rotating in magnetic fields on ball bearings! This permitted them to move faster and invade the larger, more sluggish bubblers, to consume them from within. So, all this warfare and exploitation resulted from bacterial individuation and led to new technologies used in hostile ways. Somehow, the long period of what I call "bacterial imperialism" eventually gave rise to negotiations among the breather invaders and their bubbler host colonies, plus some bluegreens taken aboard. These bluegreens could make food for the colonies when breathers motored them into sunlit areas. As the new kind of cell evolved, each gave most of their DNA to a central library called the nucleus, which collected new genes, new information, over time. We are still learning how these large multi-creatured single cells went on to evolve themselves into multi-celled creatures (second diagram in the slide). Direct connections have just been discovered, for example, between the nucleus and the cell membrane, showing how the decisions made in the cell membrane, which at least one biologist named Bruce Lipton argues is the real brain of the cell, is in direct connection with the nucleus. That gives the nucleus opportunity to dialogue with the cell's membrane so that joint decisions can be made. I call that single cell a multi-creatured cell because the ancient bacteria co-invented it and actually resided in it together. From their descendants in the offspring of these cells came all the multi-celled creatures from ants to elephants, from flatworms to redwoods and you and me. Everything that is not a bacterium is or is made of nucleated cells. Again we see divisions of labor and reorganization, the evolution of nervous systems to coordinate, et cetera, et cetera. This new multi-creatured cell up at the top of the slide is a biological view of globalization -- humanity repeating what the ancient bacteria did two billion years ago. I call this "fractal biology" because it is the same pattern at a new level. We are in the process of creating a global-level cell out of individual humans coming together in community within the planetary host cell we have been colonizing. 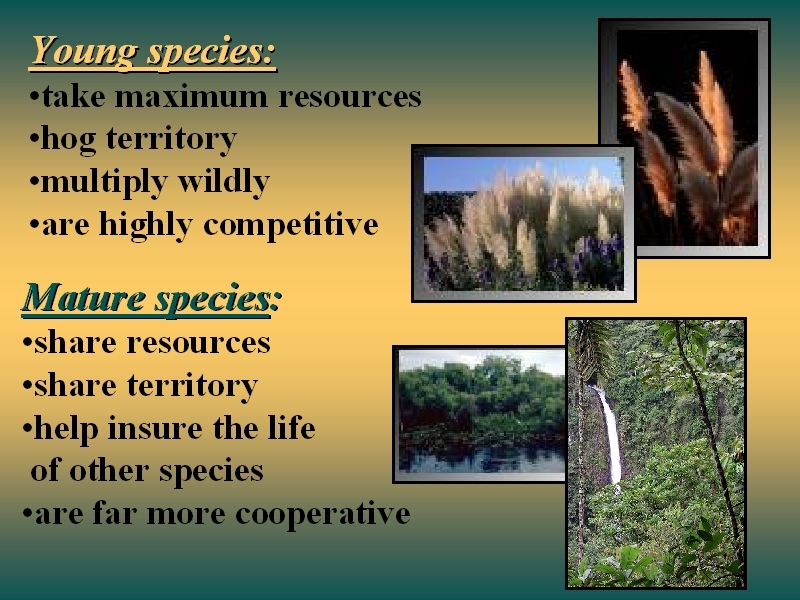 It also represents our shifting from the competitive stage of an immature species to its mature, cooperative stage. Not that competition ever goes away because everything happens at once all the time. It's a rich situation. But we are learning global harmony. We are able to have air traffic control all over the planet. We have a global communications system. We have the Internet. There are lots of examples of our great ability to cooperate at the global level. It's just that our global economy is so out-of-whack with living systems, that it stands out as glaringly inappropriate, as we've seen. The reason we haven't noticed this glaring problem is that our economy was developed in denial of our role within nature and great ignorance of how nature works. Our social models, including our corporate world, were designed as mechanical models. But organism and mechanism are very different as the next slide shows. In one form or another you've often seen this kind of comparison of mechanism and organism, because, in our human cultures, to make this transition into the global body, the new multi-creatured cell, we are gaining increasing understanding of how we've been organizing ourselves and how we need to organize ourselves if we're going to be a living system compatible with other living systems. At present we're moving away from inventor-created, allopoietic systems to autopoietic systems -- literally self-created systems, living systems in holarchy instead of hierarchy, with negotiations instead of top-down command; systems that negotiate cooperation and thus design themselves from within instead of being engineered and repaired and redesigned by inventors or designers. Why do we exist? Usually our mechanically conceived systems exist for some kind of product or profit -- whether the product is a child out of a school, or a manufactured car out of a factory -- and usually they serve the interest of their owners. I leave it to you to decide who owns our societies, who decided that we should have factory-worker preparing education, and so forth. 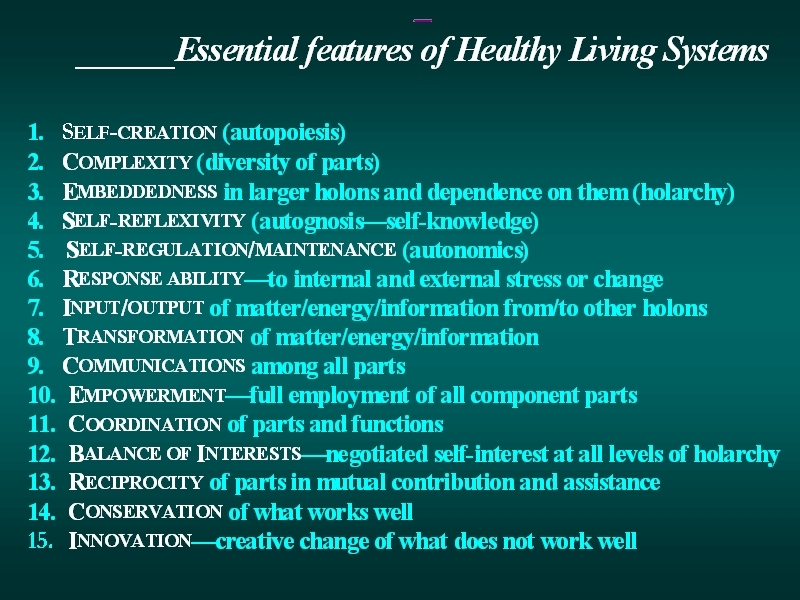 Let's look at a list of essential features of biological living systems. These are essential features that I have abstracted from actual biological systems. Here's where we're going to talk about the Internet, because, as we go through the list, I want us to think about the Internet versus multinational corporations -- two human systems, one designed from outside, then filled with employees; the other a truly self-organizing system. These features were taken from biology, as I said. I was not thinking Internet when I made up this list. Self creation is the first one, autopoiesis. The Internet is self-creating. 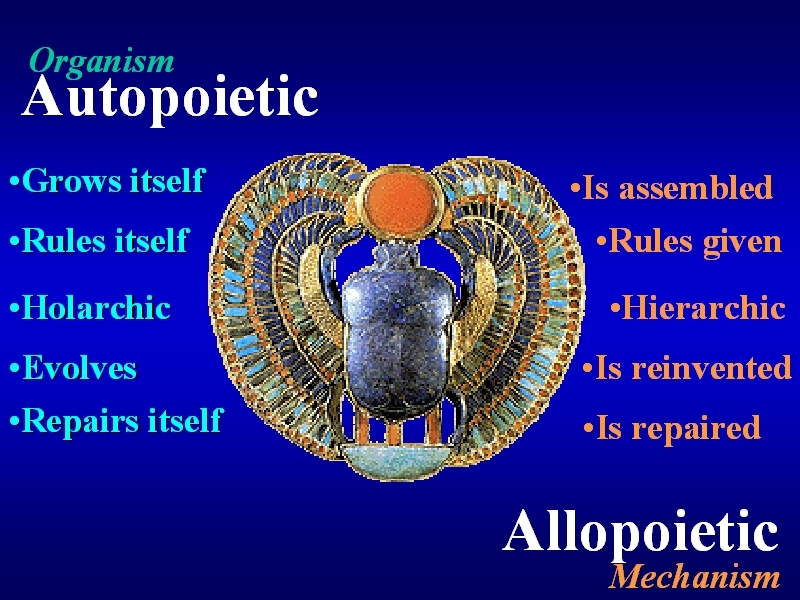 Most corporations were designed by somebody from the outside as an allopoietic system. The Complexity (2) of the Internet is far greater than the complexity of any one of our organizations. This is true because of the number of players, because of the complexity of each player that plays in the system. It's not that a company like Siemens, for example, which employs almost half a million people, doesn't contain a lot of complexity, but as an organization they don't avail themselves fully of their own human resources. They only want particular skills from their employees that fit their design, production and distribution model. I spoke to their top managers not long ago and learned how the company ignores the life needs of the employees and their creativity. Why should personal goals, such as sustainable health and service to community be so different from corporate goals? Embeddedness in larger holons (3). Again, corporations are embedded in local and global society but they do not behave as though they are. They ignore the fact that they are dependent, for instance, on the ecosystems of the world. The Internet is also an embedded situation where every web page is embedded within some kind of a Community, which is embedded within some larger Community. You can see holarchy everywhere, as evident in the design of search engines. I think the miracle of the Internet is that we can have a hundred and fifty thousand new players a day, two-plus million new pages a day! How do search engines still manage to get any information you like to you in seconds? Isn't it just miraculous? It's surely beginning to look like a biological entity. You know there are going to be creative new solutions because this is a living system. Even if the entire Internet failed, due to some technological glitch or some problem that wasn't solved yet, it would reinvent itself, arise again. Self-reflexivity (4). The system knows itself because it talks to itself. Self-regulation and maintenance (5) -- autonomics. The whole idea was that the creators of ARPAnet, the original version of the Internet commissioned by the Army, designed a system in which you could get messages through no matter what parts of the systems were damaged. The system had to work with what was left and know how to repair itself. Continuing down the list, we have Response ability, to internal and external stress or change (6). Responses to viruses and to all kinds of environmental stresses. Input/output (7). What is the matter/energy/information that comes from other holons into the system and moves out? When you do this analysis for a corporation in terms of all its ideas and materials, you find out that a lot of its output is damaging waste that is not taken into account. It is a living system, since it's made up of people, but it doesn't behave like one, because it's people are boxed into a mechanical design. We've talked ourselves out of acting like the living systems we are! We've talked ourselves into believing we can function as machines in our organizations. Again, the Internet is doing it very differently, and most of it is still a great conversation. Although now, products have gotten involved because corporations finally got their sales pitches and convenient buying established on it. But the Internet is also pulling in the corporations through its power of life with very interesting consequences. The power of this self-organizing, living system is such that it can force changes in corporate behavior. I started this talk out by mentioning The Clue Train Manifesto, talking about how the Great Conversation natural to humans has been liberated by the Internet. The usual sales hype doesn't work and the companies are now being forced to be more honest about their products, to distribute them in different ways. We're seeing it happen in front of our eyes. This is like going back two billion years and watching how the bacteria did it! Transformation of matter/energy/information (8). Work these out for yourselves. Communications among all parts (9). As I said, in the corporation you're trying to prevent communication among parts. They're trying to decide what to do about their employees being on the Internet. They have to be on intranets to function now. And they're getting on to the Internet as well and it's causing problems because the employees are talking honestly to their markets. Who goes to hear a salesman's hype when you can get the real low-down on the Web!? The Full empowerment of all the parts (10). Everybody who gets online is empowered to play a real role. Nobody is left out once they enter cyberspace. Coordination of parts and functions (11) is the hard part. Yet it's been miraculous how well the search engines have worked, how well the organizational thing happens within all this complexity, among all these parts. The Balance of interests (12) is about the negotiated self-interest that serves all parts of the system. The Clue Train Manifesto has a wonderful line in it saying, "What happens when we talk to the poor of the world and find out we're keeping them poor?" What happens when we really get this and recognize that we're the body of humanity in formation as a new giant cell? The Reciprocity of the parts (13) -- what can we give to each other? I have a friend named Jen Vaughn, an oil lady from Texas who wrote a whole book about the gifting economy, Saying that if everybody gave to society the way mothers give milk to children we would have no economic problems, no one in need! Why are we spending so much of our time scrabbling to meet the bills, and things like that? We are at a time now where we're questioning even the money economy, where alternative currencies are coming up all over the world, including on the Web. The Web has learned that giving things away is a wonderful way to operate. The Web has learned all kinds of things about living systems by starting to organize itself as one. And it continues to learn as it goes. On down the list: Conservation of what works well (14), innovation with what doesn't work well (15). This is basically about the inappropriateness of the way we divide ourselves into Democrats and Republicans, the way that used to mean radicals and conservatives, as though we had to choose between those designations. Now these lines are blurring because we're finding out that the world wouldn't work if you weren't conservative about what works. Nor is it ever going to go anywhere if we don't innovate. It's not a matter of our artificial either/ors; in a living system it must be both/and. The lessons of nature: all living systems self-organize and maintain themselves by the same biological principles which we can identify and abstract. We can create these models of nature in different ways, but I believe they will all reveal this kind of picture. Among those principles are the empowered participation of all the parts and the continued negotiation of self-interest at all levels of organization. Now, think of this as a syllogism. 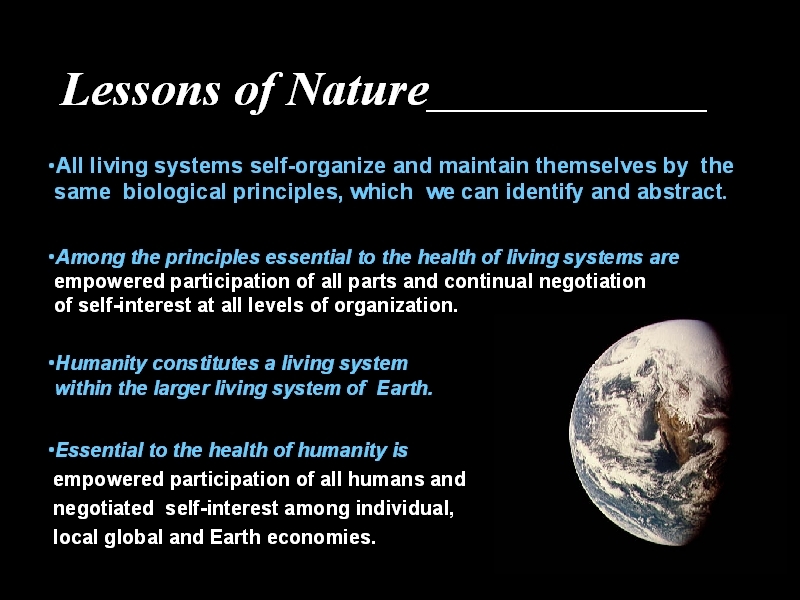 If those two things are true and humanity constitutes a living system within the larger living system of Earth, then essential to the health of humanity is the empowered participation of all humans and the negotiated self-interest among individual, local, and global economies as well as the Earth itself. If we learn about living systems it will be much easier for us to behave like a living system. Remember that globalization is a natural process to bring us to mature humanity. Let's ask ourselves whether we are ready to behave like a mature, cooperative human species. I hope this has been a little bit helpful to you. Maybe we have time for a few questions. Thank you. Question: You talked about autopoiesis and you also talked about self-interest and I think in terms of greed -- I don't think in terms of greed -- but it sounds a bit like greed and self-interest to me. Elisabet: The greed that can arise in self-interest is limited by the fact that in a living system you must negotiate with the other levels of holarchy. Question: That's my question. As we see the Internet making more and more of us individually empowered, how do you see us achieving this self-regulation? I can go online, I can order everything that I want. I have eliminated all mediation, all professionals, all expert opinions and I am basically creating my own world. I see a danger in that in that I don't need to really coordinate with other people to create the world that I want. I am incredibly empowered by the Internet and I have to choose to want to collaborate with someone else. I have to chose to, perhaps, talk to a mortgage broker or talk to an expert in some area. Or I can just believe that my own expertise is the only thing I need. And I'm interested in how you see that self-regulation taking place as we continually have more and more power delivered right to our desktops or to our home laptops. Elisabet: It's not fundamentally different from the conversations that you have had in your life with people throughout your life. You've had conversations and negotiations with teachers, with parents, with shopkeepers; the conversation is always going on. The Internet makes it more powerful because you can talk to so many more people at once and you can get much more feedback at once. Living systems do tend to self-regulate themselves, but we have made rules and set up other barriers and inequities that interfere with this happening naturally. We are beginning to get more interested in indigenous cultures and in stone age cultures and we're hearing that they only worked two to three hours a day, on the average, to maintain themselves in good health with a lot of interesting things going on in their lives. We're beginning to ask ourselves, Is "thing-glut" what we really want? And if you're going to spend a lot of time online, what are you going to do with all the things that you piled up behind you that came in the mail? You buy all these books from amazon.com but you don't have any time to read them. Eventually you will self-regulate. I self-regulated in 1978 by selling my house which I'd raised two kids in and which was full of things. I felt thing-glut like an unpleasant disease. I didn't like being among so many things; my style was cramped. So, I got rid of the whole thing, kit and caboodle, and went off to Greece and lived on an island for thirteen years in a very simple lifestyle and it was enormously rewarding. Even though I was chopping firewood and stuff like that and had to conserve water. I did my best creative thinking then. So I think this kind of thing happens to living systems, that they will go as far as they can go with something and then reorganize on another level. My basic law of the universe is: Anything that can happen, will happen. However, what survives is what finds harmony with what's going on around it. Galaxies can swallow up other galaxies. All of this stuff that we call greed -- that we've been acting out -- is about taking greed to a very extreme degree in our world. Now we see that what it's causing is a situation that can only be alleviated when, as The Clue Train Manifesto says, we ask: What will happen when we talk to the poor of the world and realize we're keeping them poor? What is our self-interest as humans? Can we exist as a body with extensive cancer? -- with horrible inequities and cultures being killed off in the name of consumerism? I think we are waking up. The feedback is coming in. We don't want a society based on consumer values. We want a society based on human values. It is shifting big time. Paul Ray's study of Cultural Creatives: there are over 50 million people in the United States alone, who have the values of ecology, community, feminism and personal, spiritual growth. We're recognizing that we're spirits having human experience. We're thinking on more levels. All of these things, I think, will impact that very basic problem that you raise. It may not be visible, up-close, right this minute. But it either happens or we go extinct. As Pierre Teilhard de Chardin put it: The day is not far distant when humanity will realize that biologically it is faced with a choice between suicide and adoration. See The Biology of Globalization, by Elisabet Sahtouris, 1998. Ibid, specifically, the section on "The Principles of Living Systems." See information about community currencies on rat haus reality. E.g., see Internet Currencies for Virtual Communities, by Bernard Lietaer, presented on Transaction Net. See the Cultural Creatives Home at www.culturalcreatives.org, and Peter Montague on Paul Ray's and Sherry Ruth Anderson's new book, The Cultural Creatives, in Rachel's Environment & Health Weekly #711, 11/9/00.